After food, a feral cat’s greatest necessity in winter is shelter. Cats are excellent at finding their own makeshift shelter, but they really benefit from a well-insulated house placed in a safe location. Here are plans for a shelter built in a large plastic storage tote. The first floor tile should go in easily, the second will not fit exactly (short about 2”). You may either cut it to fit or simply overlap the first. Measure 2” from interior corner and 2” from top (of the insulation, not the tote itself), these will determine the edges top and side of the hole. Set 6” hole saw here and slowly begin drilling. A hole saw this big tends to buck so expect it to go slowly. You may need to move saw to the front of the tote to cut through the wall of the tote. This step adds a liner to the entryway but is not essential. You can simply add duct tape to the perimeter of the opening to protect the cat from the edge of the insulation. Cut plastic flowerpot about halfway down. Set it in place in the doorway, caulk into place, both under the lip and from the inside of the shelter. Allow to dry completely. The shelter should be stuffed with straw to provide additional insulating capacity. Additionally, the shelter should be set off the ground, on 2x4s or bricks (we use discarded wooden pallets). 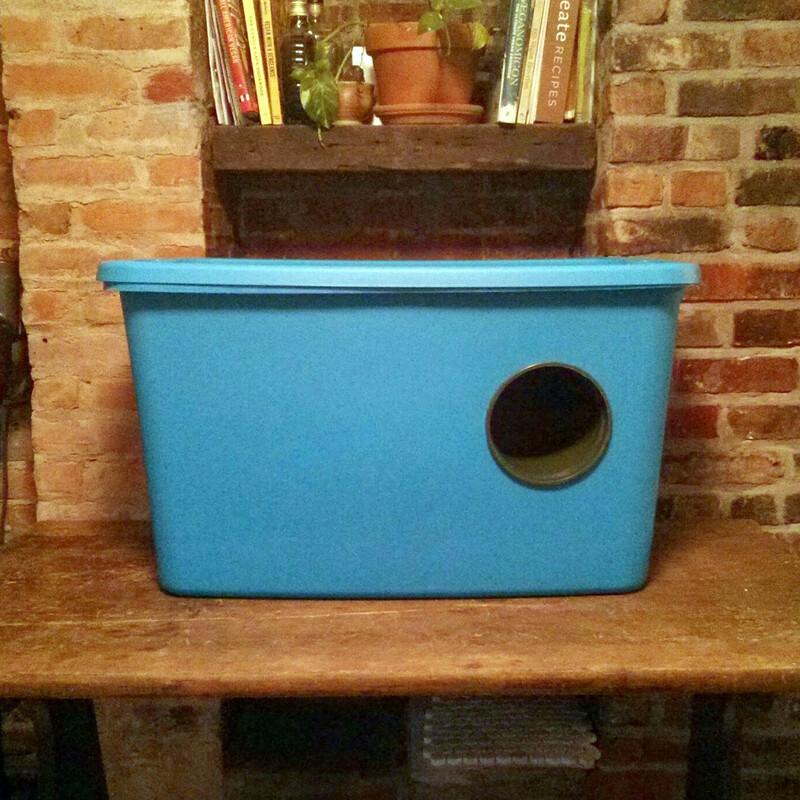 Bushwick Street Cats — 2015 Bushwick Street Cats, Inc.